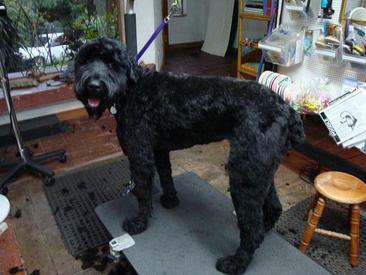 Really, why do you want a Black Russian Terrier? I'm sure that if you are visiting this website you are interested in the Black Russian Terrier as a dog for your family. But now that you are here I really want you to think about this breed of dog, how it will fit into your family. You absolutely need to think this decision through before you decide that this is the breed of dog for you. 1. You see the dog on the top of the page and think that you would like one like that. You've seen it on TV on the Westminster or Eukanuba shows. You want one that looks like that. Well, you have to know that having one that looks like that takes an incredible amount of time in grooming, brushing, and coat conditioning. You don't have to do it every day, but I will assure that it's much easier to do it several times a week then it is to skip it until a day becomes a week, becomes a month and you have an impossible mess of knotted, matted coat. Removal of matts is painful to the dog and takes work over a period of time or else you end up with a "shaved down" brt that looks much like the one on the left instead of the one on the right. If your dogs live in the house (which they certainly should), you should plan on 2-3 hours a week of brushing and dematting. You could add another 2 hours to that for bathing and blowing dry. If you want a real guard type of breed, but really don't want to deal with hair, maybe look at a breed that doesn't have hair. 2. You live in a household where "mess" would cause problems. Some people really like tidy lives and tidy houses. The BRT is a big dog and while they don't shed in the sense that a Golden or GSD sheds, they do have an undercoat. That undercoat will end up as tumbleweed on your floors and little black balls of hair on your carpets. But the tumbleweed is a small problems....the BRT is a bearded dog. Have you ever had a bearded dog? Bearded dogs drink water, some have "wet" mouths which result in some slobber. I have purchased a variety of water bowls designed to minimize the problem, but their faces get very wet when they drink. They shake their heads, the mirrors get water spots, the walls get water spots, the furniture gets water spots, they wipe their faces on the upholstery. Some people say that they wipe their dogs beard with a towel after they drink, but personally I'm not home all day, nor am I up to running after my dog with a towel every time they get a drink of water. Your doors and windows have a "puppy nose" look. Dog owners frequently learn to overlook these things, but if this is an issue for you or someone in your family, you would want to give serious consideration to it. Do you have hard wood floors? Would you mind if they were scratched by dog nails? The BRT is a large and heavy dog and even if you are pretty diligent about keeping the nails ground short (most of us aren't), their size, weight, and running will scratch your floors. 3. You don't understand what "socializing" a dog really means. I had a lot of dogs over the years. We never did anything special to socialize them, just lived our lives and the dogs adapted. 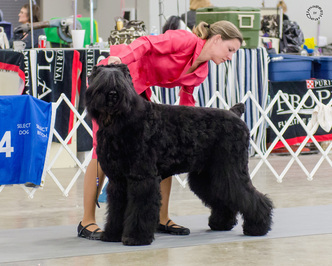 I didn't know that socialization was something that you actively did, and put a lot of effort into doing before I had a Black Russian Terrier. So you work every day, come home from work, and then just want to relax.....not for the first two years you don't. You have to start taking this dog out as soon as you get it. You should set a goal of giving the dog at least 4 new experiences a week (places, smells, people, sounds). They need to be quite comfortable around the variety of things they will come up against in life. You don't want a dog this size who has not been acclimated to the outside world and either becomes fearful or worse yet, fearful/aggressive around unexpected occurrences. So look at your life carefully to determine how much time you have to devote to working with this dog. They need structured obedience training and a lot of exposure to the world to turn into something that you want to live; it's not just putting down a food bowl and opening a door to let them in and out. If your life is full of activities and commitments, then maybe this is not the time to add another commitment to your life. 4. You really don't understand what it means to have a guard dog. Some people think they want a guard dog, when all they really want is a dog who will bark when someone comes to the house. That's not a guard dog, that's a door bell. The Black Russian will protect you and the home from an intruder. You need to be prepared to have a dog that will not allow a stranger to enter your home, even if it is one you want there, without a lot of obedience training or the willingness to introduce the dog to the person through a proper introduction. When a person who the dogs do not know plans on visiting, I do not allow them to just walk in the house. The dogs are first put in the back yard and I greet the person in the driveway where the dogs can see that this is an invited guest and everything is ok. After we chat a few minutes, the visitor is allowed to go to the gate to greet the dogs. Then we come into the house. Once the dogs have seen and greeted the person there is no problem. On the other hand, if it is a person who I am not expecting and do not want in my home I greet them through a locked storm door with the dogs at my side and I assure you that no one would attempt to gain entry. The point is that you need to know what you want, and what you will be getting, BEFORE you get it.